The rising popularity of Thunderbolt 3, coupled with the emergence of NVMe SSDs in the compact M.2 form-factor, has enabled a new class of portable high-performance flash storage devices. External SSDs with a Thunderbolt interface have been around for a few years now, but, the price to performance ratio had prevented them from getting wide acceptance. Things are changing with the portable Thunderbolt 3 SSDs, and wallet-friendly choices are emerging, thanks to Phison's reference designs that went public at the 2018 CES. We recently reviewed TEKQ's Rapide, a portable Thunderbolt 3 SSD using a Phison controller (but, not the 3D TLC-based low-cost reference design). Patriot Memory looks likely to be the first vendor to bring a version of the reference design to the retail market in the form of the Patriot Evlvr. Patriot is still working on the final packaging of the product for retail availability by the end of Q3 2018, but, they sent us one of their 1TB pre-production units for evaluation. The Patriot Evlvr is a 90mm x 45mm x 12mm silver-colored external SSD with an aluminum chassis. It sports a single Thunderbolt 3 interface for both power and data. The port is enabled by the Intel JHL6340 Thunderbolt 3 Controller - note that this belongs to the Alpine Ridge family, and hence, works only with Thunderbolt 3 Type-C ports. On the other side of the JHL6340 is a PCIe 3.0 x4 connection that leads to a M.2 slot capable of accommodating M.2 2260 or 2280 PCIe SSDs. There are no plastic components in the chassis. The chassis also incorporates thermal pads for the Thunderbolt controller as well as the M.2 SSD. 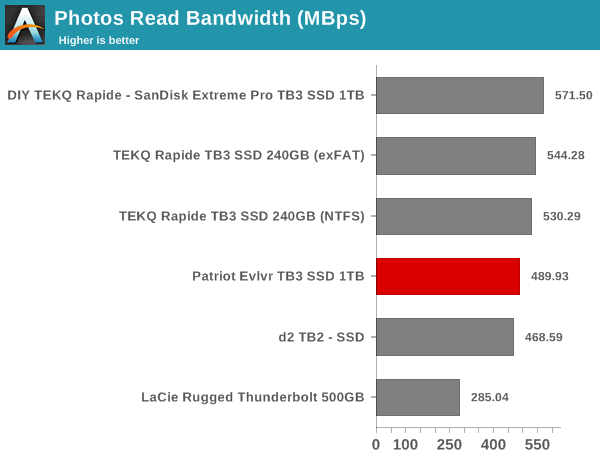 Despite the main board supporting a PCIe 3.0 x4 SSD, the Patriot Evlvr uses a PCIe 3.0 x2 NVMe SSD. As the photographs in the gallery above show, the SSD uses a Phison PS5008-E8 controller. The stick includes four flash packages (Toshiba BiCS 2 3D TLC flash), along with 512MB of DDR3L DRAM. The set of Thunderbolt 3 SSDs that we have evaluated is quite small - the only other unit in its capacity class is our DIY configuration with the TEKQ Rapide enclosure and the SanDisk Extreme Pro M.2 NVMe 3D SSD. Various synthetic benchmarks are available to quickly evaluate the performance of direct-attached storage devices. Real-world performance testing often has to be a customized test. We present both varieties in this review, starting with the synthetic benchmarks in this section. Prior to covering those, we have a quick look at our testbed setup and testing methodology. Evaluation of DAS units on Windows is done with the testbed outlined in the table below. For devices with a Thunderbolt 3 (Type-C interface) connections (such as the Patriot Evlvr TB3 SSD 1TB that we are considering today), we utilize the USB 3.1 Type-C port enabled by the Intel Alpine Ridge controller. It connects to the Z170 PCH via a PCIe 3.0 x4 link.. The full details of the reasoning behind choosing the above build components can be found here. The list of DAS units used for comparison purposes is provided below. Patriot claims read and write speeds of 1.5 GBps and 1 GBps respectively, and these are backed up by the ATTO benchmarks provided below. Unfortunately, these access traces are not very common in real-life scenarios. CrystalDiskMark, despite being a canned benchmark, provides a better estimate of the performance range with a selected set of numbers. As evident from the screenshot below, the performance can dip to as low as 38 MBps for random reads at low queue depths. However, the peak performance is as good as what we saw in the ATTO benchmark. Our testing methodology for DAS units also takes into consideration the usual use-case for such devices. The most common usage scenario is transfer of large amounts of photos and videos to and from the unit. The minor usage scenario is importing files directly off the DAS into a multimedia editing program such as Adobe Photoshop. For the second use-case, we take advantage of PC Mark 8's storage bench. The storage workload involves games as well as multimedia editing applications. The command line version allows us to cherry-pick storage traces to run on a target drive. We chose the following traces. Usually, PC Mark 8 reports time to complete the trace, but the detailed log report has the read and write bandwidth figures which we present in our performance graphs. Note that the bandwidth number reported in the results don't involve idle time compression. Results might appear low, but that is part of the workload characteristic. Note that the same testbed is being used for all DAS units. Therefore, comparing the numbers for each trace should be possible across different DAS units. 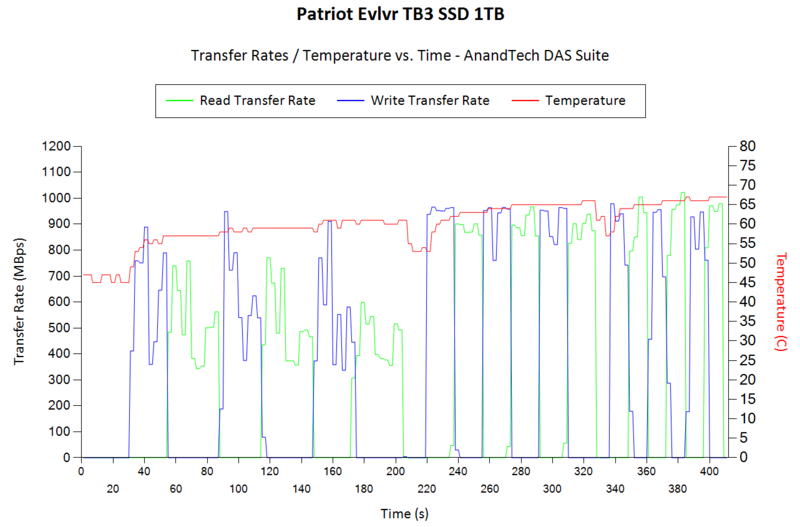 The results from both the benchmark sets show that the Patriot Evlvr can't match up to either the TEKQ Rapide, or, our DIY configuration with the TEKQ enclosure and the SanDisk Extreme Pro M.2 NVMe 3D SSD. This is logical, given that the internal SSD in the Evlvr has a PCIe 3.0 x2 interface, compared to the PCIe 3.0 x4 link in the SSDs that manage to come out with better numbers. Yet another interesting aspect of these types of units is performance consistency. Aspects that may influence this include thermal throttling and firmware caps on access rates to avoid overheating or other similar scenarios. This aspect is an important one, as the last thing that users want to see when copying over, say, 100 GB of data to the flash drive, is the transfer rate going to USB 2.0 speeds. In order to identify whether the drive under test suffers from this problem, we instrumented our robocopy DAS benchmark suite to record the flash drive's read and write transfer rates while the robocopy process took place in the background. For supported drives, we also recorded the internal temperature of the drive during the process. The graphs below show the speeds observed during our real-world DAS suite processing. The first three sets of writes and reads correspond to the photos suite. A small gap (for the transfer of the videos suite from the primary drive to the RAM drive) is followed by three sets for the next data set. Another small RAM-drive transfer gap is followed by three sets for the Blu-ray folder. An important point to note here is that each of the first three blue and green areas correspond to 15.6 GB of writes and reads respectively. Throttling, if any, is apparent within the processing of the photos suite itself. Here, we see the average write speeds for the second pass of the photos suite being slightly lower than the first pass. This points to exhaustion of the SLC cache, but, the effect is not as stark as our DIY configuration because of the inherently lower interface link speed. The temperatures are also a bit on the higher side compared to our DIY configuration. 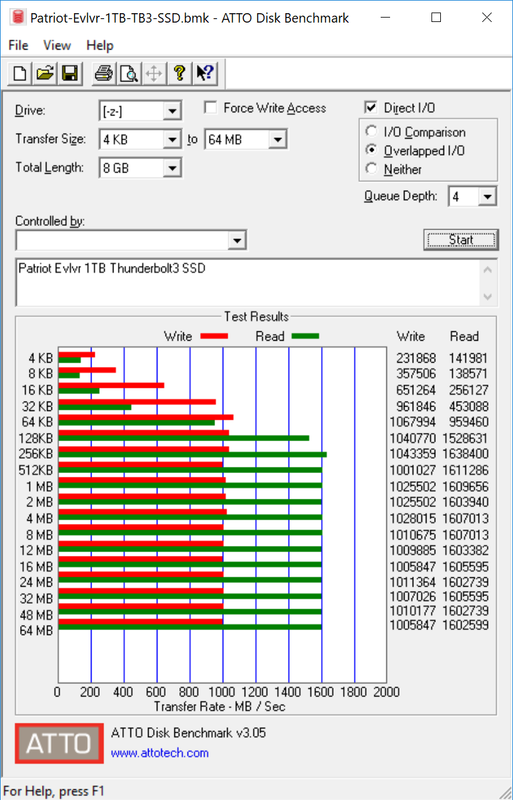 The Evlvr internal SSD reached 67C by the time we got to the end of our test suite (compared to the 57C of our DIY configuration). It is possible that the final firmware from Phison might opt to run the SSD a little cooler by sacrificing a bit of performance. 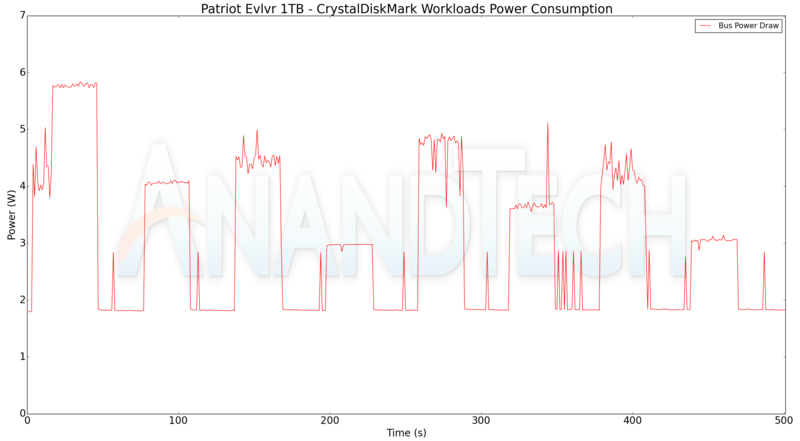 In any case, the current configuration sampled by Patriot does run a bit toasty compared to both our DIY configuration and the 240GB version of the TEKQ Rapide. The Thunderbolt 3 specifications indicate that the host port must be able to supply up to 15W for bus-powered devices connected to it. Since the Patriot Evlvr is a bus-powered device, it is given that its power consumption can't exceed 15W in order to be a certified Thunderbolt 3 device. It is still relevant to take a fine-grained look at the power consumption profile. Using the Plugable USBC-TKEY, the bus power consumption for both SSDs was tracked while the CrystalDiskMark workloads were processed. The workloads were set up with an interval time of 30s. The peak power consumption remains below 6W, but, the average bus power draw over all workloads is consistently higher than the other units being compared. Support for TRIM is important to make sure that the performance consistency is maintained even after the SSD has been subject to long-term use. Since the Thunderbolt interface is transparent for all practical purposes, and the host OS sees a PCIe NVMe SSD, it comes down to the internal SSD supporting TRIM. We were able to successfully activate TRIM in the Patriot Evlvr. 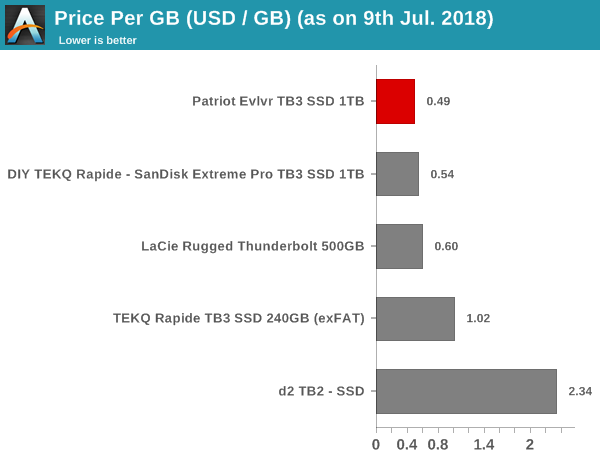 The final aspect that needs to be addressed is the pricing - Patriot announced that the 1TB variant of the Evlvr would retail at $490. 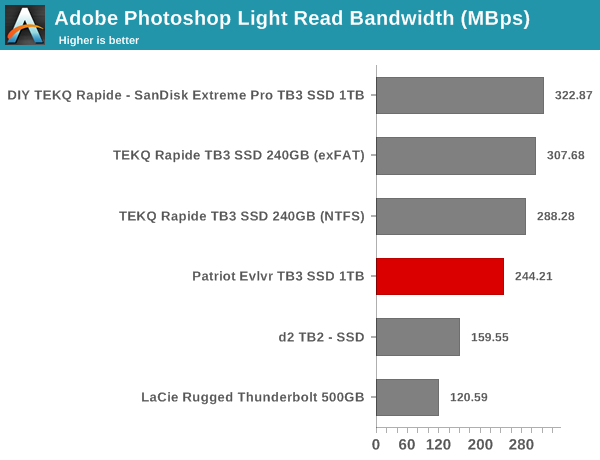 On a per-GB basis, this translates to the Evlvr being the most affordable Thunderbolt 3 SSD that we have tested. We believe that the target market for Thunderbolt 3 SSDs can be divided into two - one belonging to the professional content creators market where time is money, and the other being the average consumer that just wants a fast portable drive and is only read to pay a small premium over a USB-based flash drive like the Samsung Portable SSD T5 or the SanDisk Extreme Portable SSD. The former requires extreme performance, and is willing to pay the price premium for that - Devices like the Sonnet Fusion, LaCie Bolt3, TEKQ Rapide, and our DIY configuration with a PCIe 3.0 x4 NVMe SSD (SanDisk Extreme Pro M.2 NVMe 3D SSD with the TEKQ Rapide enclosure) target that market. 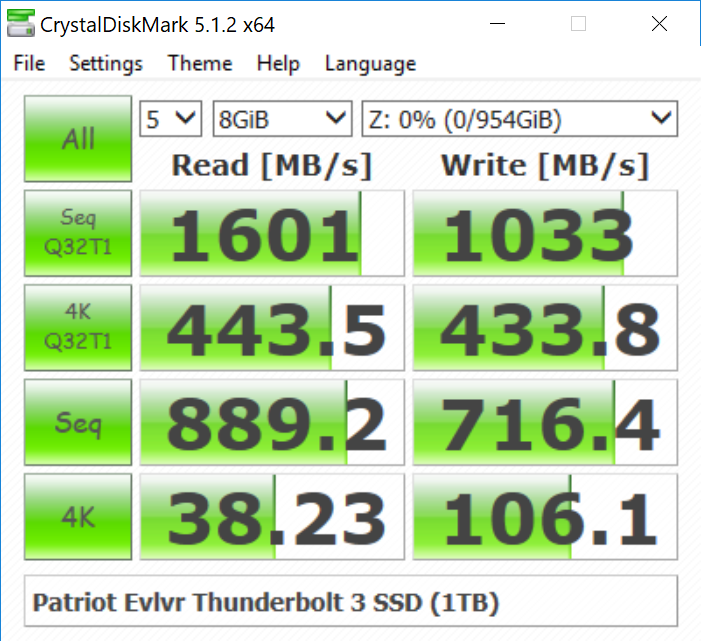 The Patriot Evlvr is one of the first portable Thunderbolt 3 SSDs to target the latter segment. That said, one of the aspects that make devices such as the Patriot Evlvr (and other low cost Thunderbolt 3 SSDs that will use the Alpine Ridge controller) a tough sell is their incompatibility with the generic USB Type-C ports. These SSDs work only with Thunderbolt 3 ports, and while the former market segment is able to easily understand that, the second segment may increase the customer support workload. Flash prices are on a downward trend, and it is possible that the 1TB Evlvr could launch at a price lower than the planned $490. 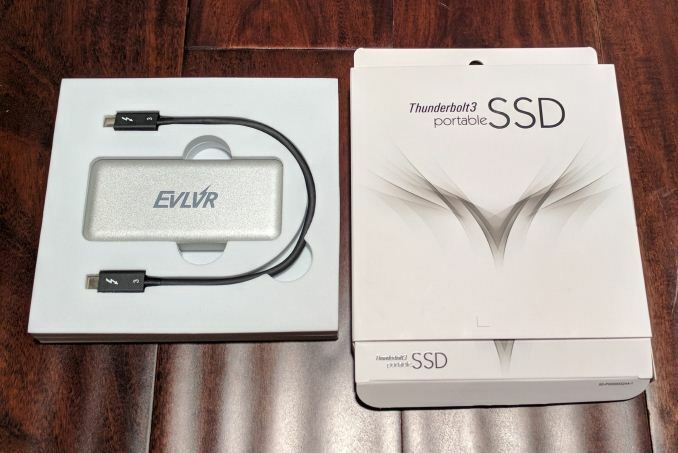 Even at that price, devices such as the Patriot Evlvr are sure to please cost-conscious consumers, and that is bound to benefit the Thunderbolt 3 ecosystem. TB3 also can be use for external graphics card - which are same as ones used on desktop - but I believe are limited to only PCI e 3.0 x4 but using a full x16 card. TB3 also can be daisy chain. Great for docks.